Algal blooms are natural occurrences, and may occur with regularity (e.g., every summer), depending on weather and water conditions. The likelihood of a bloom depends on local conditions and characteristics of the particular body of water. Blooms generally occur where there are high levels of nutrients present, together with the occurrence of warm, sunny, calm conditions. Natural sources of nutrients such as phosphorus or nitrogen compounds can be supplemented by a variety of human activities. Nutrient sources can include treated waste waters from septic systems and sewage treatment plants, and urban storm-water runoff that carries pollutants such as lawn fertilizers. An algal bloom contributes to the natural “aging” process of a lake, and in some lakes can provide important benefits by boosting primary productivity. But in other cases, recurrent or severe blooms can cause dissolved oxygen depletion as the large numbers of dead algae decay. In highly enriched lakes, algal blooms may lead to anoxia and fish kills during the summer. 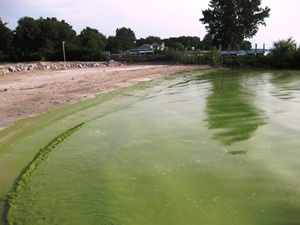 Lake Erie had a catastrophic bloom in the Lake County area several years ago after days of torrential rain poured storm sewer runoff into the Lake. The result was tens of thousands of fish killed that totally covered the near shore waters and beaches. It took weeks for the stench from the dead and decaying fish, detectable from miles inland, to abate. Lakeshore property owners and natural scavengers eventually removed the acrid mass. Repeated episodes of algal blooms can be an indication that a river or lake is being contaminated, or that other aspects of a lake’s ecology are out of balance. However, prevention of a problem is always better than trying to fix the problem after it happens. Controlling storm-water runoff; properly maintaining septic systems; and properly managing residential applications of fertilizers are probably the most effective measures that can be taken to help prevent human-induced fresh-water algal blooms. Sewer districts along the lake have been addressing this problem and some federal stimulus money has gone into repairing defective storm sewers that cause overflow from sanitary sewers during heavy rains. 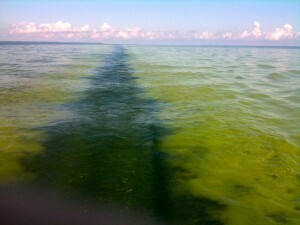 Predicting harmful algal blooms, or HABs, in the Great Lakes is now a becoming reality as NOAA announces an experimental HAB forecast system in Lake Erie. HABs produce toxins that may pose a significant risk to human and animal health through water recreation and may form scum that are unsightly and odorous to beach visitors, impacting the coastal economy. Forecasts depicting current and future locations of blooms, as well as intensity, will alert scientists and managers to possible threats to the Great Lakes beaches and assist in mitigation efforts. When a harmful bloom in Lake Erie is detected by the experimental system, scientists issue a forecast bulletin to nearby scientists and community managers. The bulletin depicts the HABs’ current location and future movement, as well as categorizes its intensity on a weekly basis. The Ohio Department of Natural Resources Office of Coastal Management posts the NOAA weekly bulletin on its website. Postings are available from August 20th, 2009. These are PDF files and viewable or down-loadable with the standard Adobe Viewer. If you do not have the viewer you can download it free at: http://get.adobe.com/reader/.